There are four lime kilns in Houston County of these two were listed in the National Register of Historic Places in 2004. The two lime kilns in Erin, the Quarry Lime Kiln (off Hwy 49 1/4 mile East of Denmark Road) and the Double Stack (next to the Mason’s Lodge on McMillan Street) are both listed in the National Register of Historic Places. The other two lime kilns in Houston County are the Cook Hollow Lime Kiln (near Briarwood Road) and the Stewart Lime Kiln (located off Hwy 147 in Stewart). The lime kilns are of significance to Houston County because of their once importance to industry in this area and the Middle Tennessee region during the late nineteenth and early twentieth centuries. Historically the lime industry was the primary industry in Houston County and continued to dominate both economics and settlement patterns in the county until the decline of the industry in the 1940’s. 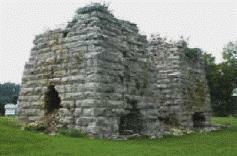 The Erin Lime Kilns were erected circa 1871. These twin kilns are approximately twenty five feet in height and nineteen feet square at the base. They are located on McMillan Street in Erin and can be seen from Highway 49 on the West end of town. The former railroad tracks lie in close proximity to the kilns. Because of the freeze and thaw effects of our weather cycles and the weight of the stones, both of the kilns have some large cracks. The Erin Lime Kilns have had numerous owners with different company names and have hence become known as they are today; the Erin Lime Kilns. John Conroy of Clarksville, Tennessee started the lime kilns. Mr. Conroy purchased a large lime ridge north of Arlington from the McMillans. This Ridge produced an extremely high quality of lime. By 1883, the two Erin Lime Kilns were producing 60,000 barrels of lime per year and employing about 100 men. These workers were partially paid with company scrip that was redeemable in the company stores. By far the largest lime industry and quarry in Houston County was that owned and operated by V.R. Harris and H.H. Buquo. These included the four limekilns of the Quarry Limekilns in Erin, which were the most modern of Houston County’s limekilns. Harris and Buquo, along with George Rauscher and Lewis Goehring, bought the quarry land next to Williams between 1873 and 1883, and entered into a cooperative quarrying agreement to burn limestone at William’s kilns. The area would later become the filled quarry lake north of Erin/Arlington. Around 1884, Harris and Buquo constructed the first of their four kilns, probably in response to the sale of William’s kiln to the Arlington Lime Company. On March 13, 1891, Harris and Buquo signed a contract with the Louisville and Nashville Railroad to build a spur line to service these kilns. In 1894, Jacob Buquo committed suicide, with his property going to his children and widow. His son, H.H. Buquo became partners with V.R. Harris and by 1895 they owned or controlled a large amount of the lime industry in the county. However, by the turn of the century, larger scale production sites were overtaking the lime industry and Houston County was losing its competitive edge in regional and national markets. At this time the Arlington quarries shifted to serve local needs, crushed stone began to dominate as the primary product, with much of the material being sold for road surfacing and agricultural fertilizer also making up a large portion of sales. Mrs. V.R. Harris took over the business, after her husband’s death in 1911. H.H. Buquo had already gone bankrupt in 1890. By 1913, Mrs. Harris was the successful owner and operator of the lime kilns. Documents for the Erin Lime Works, owned and operated by Mrs. Harris, showed that up to 150 persons were employed by the company on a monthly basis. Workers were paid $1.05 to $1.40 per day, with half being company script. Managers were paid $75 to $100 per month. The kilns were still in operations as records indicate expenses for repairs. After, Mrs. Harris death in 1918, the Rauscher’s acquired nine kilns in Arlington, with an additional kiln in Stewart. It is also reported that the entire industry was producing about 1,000 barrels of lime a day. Edward W. Rauscher was shot and killed on October 29, 1921, by young Barfield Adams who thought Mr. Rauscher had insulted his mother in a church dispute. After Rauscher’s death, his financial empire, including the Erin Bank and the lime business, collapsed. The Rauscher’s owned the Arlington Lime Company until 1925, when they sold the entire business to Southland Lime Company. The Southland Lime Company constructed the large quarry and kiln tram system seen in most historic photos of the Arlington lime industry. Falling victim to the Great Depression, this company went bankrupt in 1929. The Erin Lime and Stone Company bought the Arlington Lime Kiln land in 1932. Hugh Metcalf became co-owner and manager in 1936. Lime was still being burned, powder from the crusher was sold as agricultural lime, but most jobs were for road surfacing and riprap for bridges. Metcalf purchased the entire operation in 1942, and changed the name to Metcalf Stone Co. One new area of business for crushed stone was for TVA related projects. Metcalf was drafted and leased the quarries to Memphis Stone and Gravel Company. They abandoned the Houston County quarries in 1947 and Metcalf was never able to restart the operation and closed the quarry in 1968. The Erin Lime Kilns played a significant role in defining the early economics of Houston County. The kilns processed limestone throughout the heyday of lime industry and operated well into the twentieth century. The standing kilns are a reminder of our history and those that influenced the economics of our area. This information is adapted from the National Register of Historic Places, US Dept of Interior National Park Service. The complete report may be viewed in the reference materials at the Houston County Library.